The CAB slush machine combines design, functionality, and reliability with cost effectiveness. 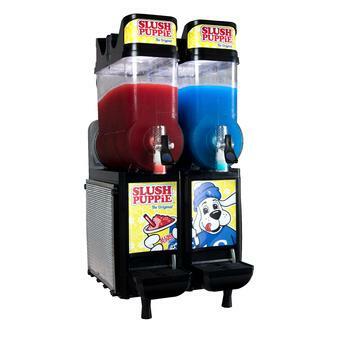 Its patented double action mixing system ensures even-textured slush beverages. The CAB features lighted displays that provide maximum visual impact as it showcases any of the frozen slush beverages offered by Slush Puppie Brands. 120 volts, 15 amps 130 lbs. Estimate Lease $67.00 - 48 Month Lease. 120 volts, 18 amps 154 lbs. Estimate Lease $104.00 - 48 Month Lease. A patented reversing auger design allows for rapid freeze time while reducing air mixing. Utilization of the touchpad display allows for simple operation of the machine while also guiding cleaning and preventive maintenance. The refrigeration system is internally monitored to provide solid, long-lasting use. Two large 3-gallon hoppers renders optimum cooling and serving capacity. Estimate Lease $69.00 - 45 Month Lease. 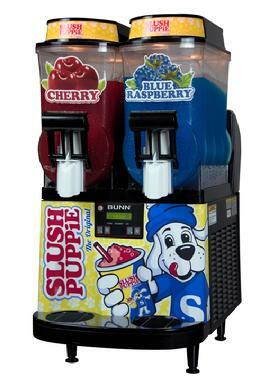 For variety, nothing beats this floor model slush machine. There are no water or drain lines needed and since it uses standard 120 VAC, it plugs in anywhere. Includes everything shown. Estimate Lease $140.00 - 48 Month Lease. 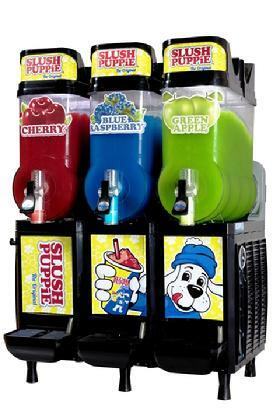 For variety, nothing beats this counter model slush machine. There are no water or drain lines needed and since it uses standard 120 VAC, it plugs in anywhere. Includes everything shown. Estimate Lease $145.00 - 48 Month Lease.